Businessman Omri Padan has joined left-wing forces in boycotting the Samaria (Shomron) city of Ariel due to its location east of the 1949 Armistice line (also known as the “Green Line”). A much-publicized leftist actors' boycott of Ariel's cultural center at the time of its opening fizzled out with time and the actors have begun appearing in the non-religious city. Academics who announced boycotts of the newly-recognized University of Ariel have found that there is no shortage of experts in any field who do accept invitations to lecture there. 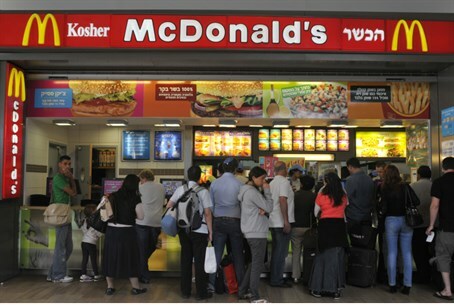 Padan, who owns the rights to the generally non-kosher McDonald’s franchise in Israel, has refused to open a branch of the famous fast food restaurant in the local Ariel mall, Calcalist reports. Padan later refused to close a branch in the Ramat Gan mall on the Sabbath, despite a decision by the Africa-Israel company to close the mall on Saturdays. “We will be a non-kosher restaurant selling cheeseburgers, milkshakes and ice-cream,” he declared. Tzachi Nahmias, who heads the Mega Or construction firm that is marketing space in the mall, told Calcalist that he is not surprised by Padans’ boycott. “Padan’s political views as a founder of Peace Now have been known for years,” he said. “But the [Jewish] residents of Ariel and the [Arabs] in the region are the ones who will be hurt by this,” he added. Nahmias noted that McDonald’s was not alone in avoiding the Ariel mall. He refused to name names, but noted that the list included companies with a presence overseas, who apparently feared that their presence in Samaria would mean a negative consumer response in Europe. “The mall in Ariel is expected to employ both Jews and Arabs from the region, and to give services to both populations,” he said.